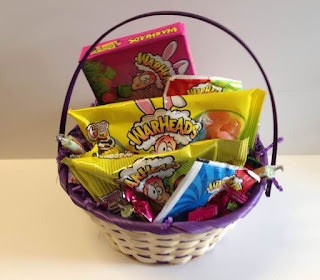 O'Ryans Village Candy Blog: Warheads Easter Basket Fille With All Warheads Sour Candies. Warheads Easter Basket Fille With All Warheads Sour Candies. Know someone who likes warheads candy ? Our warheads Easter basket would be the perfect Easter gift. This is one of most popular Easter baskets for teens. This Easter basket if filled with nothing but Warheads sour candies. Teens seem to love sour candies as well as adults, but Warheads candies are a favorite for teens. If you are looking to buy a teen Easter basket this one the perfect choice among the sour candy lovers.